Jen: I already talked about Westworld in our Best of TV chat, but that’s my pick. I’d also add The Path. If you told me last year that I’d quickly abandon a show starring Aaron Paul, I wouldn’t have believed you. Nicole: I think mine was Divorce. I watched a few episodes but it just wasn’t the least bit enjoyable. I’m too busy (and old!) for TV to be work. I also did not get the hype of The Night Of. It was like a longer Law & Order. I was so bored. Jen: Yeah, I still think The Night Of had the best first episode of the year (it was so tense I was sweating). But then it eventually dissolved into a standard, boring procedural. Jen: This felt like the year of decent shows with terrible series finales. I was ok with both The Good Wife and Gilmore Girls, but I hated the last 30 seconds of each. Nicole: I liked Gilmore Girls but I totally agree with you on The Good Wife ending. 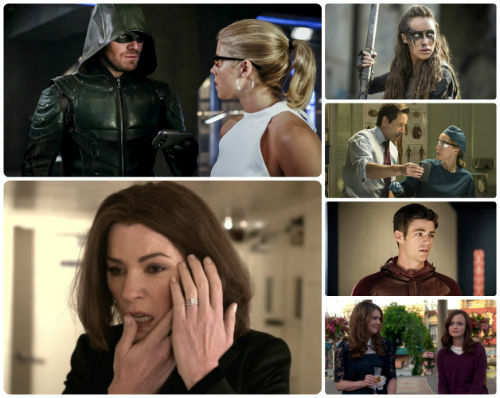 Jen: This might be the year I end up breaking up with my beloved superhero TV shows. That hurts, especially when it comes to Arrow because it was on my Best Of list in 2015. This time last year, they had just aired one of their best episodes ever (which featured a proposal followed by a brutal limo attack). But then the show fell off a cliff and never recovered. When it’s good, Arrow is a fun blend of soap opera and comic book. At the end of last season, they leaned too heavily into the former; then they tried to course-correct this season by leaning too heavily into the latter. So now it’s all about stunts, trick arrows and new costumed heroes to make the comic book fanboys happy, but if you like character development and interactions between your favourites, you’re screwed. And their treatment of the few female characters left has become abysmal: Felicity is now a pod person, Thea is marooned on her own Scandal-lite show, and Laurel just pops up randomly to bait canon worshippers. Nicole: I have crazy superhero fatigue! Arrow is the only one I’m still watching and frankly, it’s hanging by a thread. I don’t really care about any of the new people on the team and that’s a problem. Jen: I’m less invested in The Flash so I’m less disappointed in it, but damn can that show figure out another threat besides evil speedsters? I’m also bummed that Iris’ new relationship with Barry (which I don’t buy for a second) has somehow made her less of a character. She’s now been reduced to a pep talk vending machine. The only highlight of this season is that everyone is FINALLY calling out Barry for being a selfish jerkwad. Nicole: I find that I’m dropping shows because they’ve gotten just plain boring. I love a good procedural but Elementary is just yawns now. If Person of Interest hadn’t been ending they would have lost me. TV can be so good now that I think I need more of a challenge. Jen: Speaking of boring, I’m pretending The X Files revival didn’t happen, with the exception of the “Mulder and Scully Meet the Were-Monster” episode. Every other one, though? Just didn’t exist! Nicole: I had such high hopes for UnREAL after last year. Are you kidding me with showing a police shooting from the perspective of the white girl?!?! I think the characters were too unlikeable and not funny enough this season. I’m giving them two more episodes and then I’m out. Jen: Yeah, I’m with you on UnREAL, which experienced such a brutal sophomore slump. It’s like they forgot that the magic of that show is watching Quinn and Rachel together, and kept them apart nearly all season. Speaking of dropping shows, I’m not sure if I’ve ever quit a series as fast as I quit The 100 after they killed Lexa like such a gross afterthought. The only silver lining: it led to a widespread #buryyourtropes conversation about TV’s treatment of gays and minorities that’s still reverberating. Jen: The loss of Agent Carter sucked, especially since Hayley Atwell immediately jumped to a far inferior ABC show (Conviction) that was promptly cancelled. Nicole: I can’t say I’m heartbroken about any cancellations this year, but I do hope Haley Atwell finds a place to land. Jen: I’m also still mourning the cancellation of The Grinder. That show was so funny and I’m totally stumped about why it couldn’t find a larger audience.